Abigail is a third grader at Resurrection Catholic School in Cherry Hill, NJ and she is about to celebrate a birthday. But rather than looking forward to receiving presents, she came to Joseph's House to give us presents. Abigail is pictured here with her sister, Isabel, standing in front of at least 10 bags filled with scarves, gloves, hats and socks and she's holding an envelope with a donation to Joseph's House. It seems Abigail didn't want a birthday present so she asked her Mom and Dad if she could do a collection for our guests. Her parents supported her in this and before long Abigail had her friends, neighbors, classmates at school and even people from her church involved in her collection. The prophet Isaiah writes in sacred scripture that, '....a little child shall lead them'. At this time of year our minds and hearts are focusing on that little child of Bethlehem whose arrival completely changed the course of history. Well Abigail, you have made a big difference in the lives of our guests and have touched our hearts with your generosity, simplicity and joy. Thank you and Happy Birthday, Abigail! 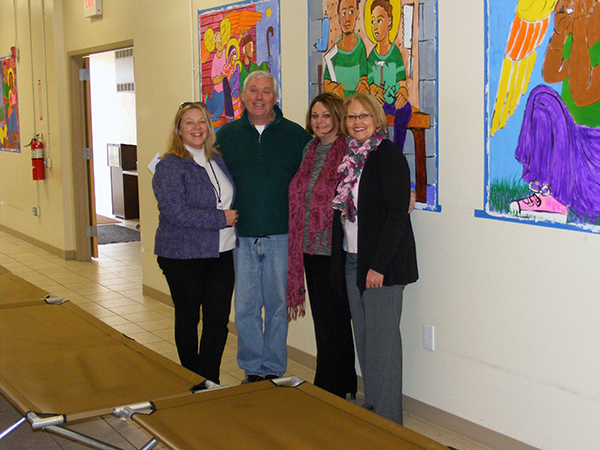 Long time partner Holy Redeemer Home Care stopped in for a quick holiday visit and to drop off a donation. 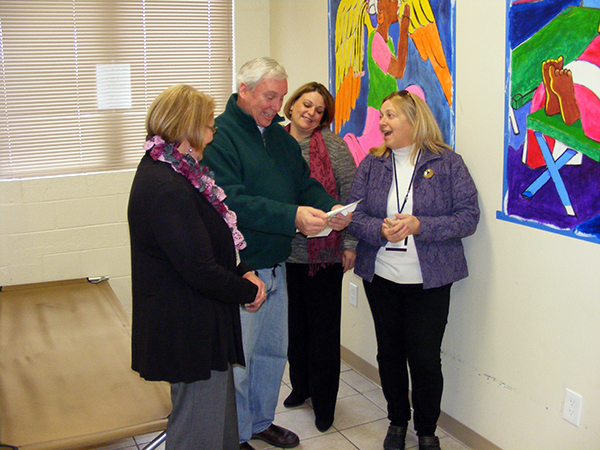 Their employees held a fundraiser for us and Alicia, Cathy and Cookie wanted to present the check to us in person. Holy Redeemer has become so deeply invested in our ministry. They sit with our guests, donate food and program supplies and act as ambassadors for us at every opportunity. They really model what it means to be a community partner. Thanks to everyone at Holy Redeemer for caring so much for our guests.